The brilliant orange of the anodized-aluminum handle is a fade-resistant, scratch-resistant dye that's permanently bonded to the aluminum - so it looks good now, and will continue to look good later. The business end of the knife is a task-ready 3-inch blade of Sandvik 14C28N stainless steel, a steel designed in a partnership between Kershaw and Sandvik. The brilliant orange of the anodized-aluminum handle is a fade-resistant, scratch-resistant dye that&apos;s permanently bonded to the aluminum - so it looks good now, and will continue to look good later. The business end of the knife is a task-ready 3-inch blade of Sandvik 14C28N stainless steel, a steel designed in a partnership between Kershaw and Sandvik. This high-performance steel enables us to make the Leek&apos;s blade razor sharp out of the box and helps it hold that edge, too. The modified drop-point blade shape makes it a good slicing knife, while the slim tip gives it excellent piercing and detail work capabilities. Whether you&apos;re left-handed or right-handed, it&apos;s easy to open your orange Leek with SpeedSafe assisted opening. A simple pull back on the ambidextrous flipper blade protrusion or push outward on the thumbstud and the Leek&apos;s blade is ready to go to work. For safety, a locking liner keeps the blade locked open during use and a Tip-Lock slider locks it closed when folded. The pocketclip is reversible for tip-up or tip-down carry and the handle is drilled to accept a lanyard. 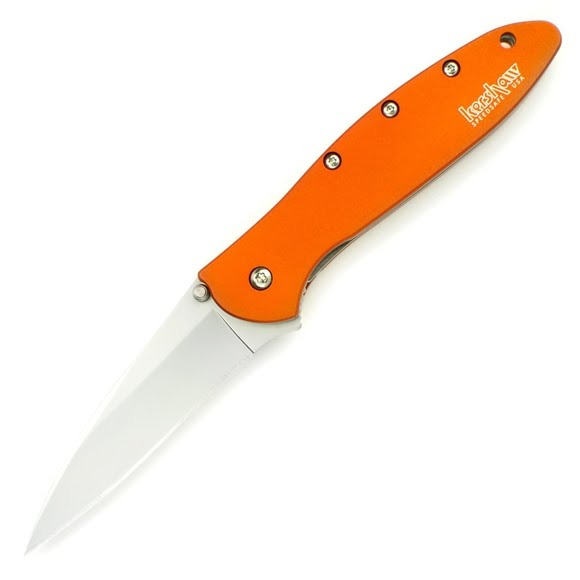 The orange Leek is a slim, easy-to-carry design that gives you plenty of cutting versatility - and good looks.